Once you are a teacher, you are always thinking of ways to use new technology with purpose. Purpose to make your job easier, purpose to help students learn new skills, or purpose to make changes in the process of being an effective 21st Century Learner. 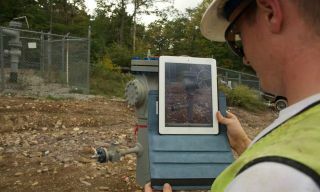 Last week while talking to our youngest son,( a Surveying Engineer working on surveying a gas line on the east coast), he was telling me how he purchased an ipad for his personal use, then when he began “playing around” with it, something changed and finally, he was excited that this was going to end up being a tool he could use at work. For a week, each morning he would call with an idea or process that he had tried out on his iPad and how it made his job easier. He explained that he could make his surveying plans into a PDF, mark them up and share with others, through their email, laptops and smartphones. Then the fact that his iPad had a camera, where he could document the joints in the pipes with an image and geotag it with longitude and latitude, added even more value to his productivity. This may not sound exciting to us in the classroom, but when you are out in the field and every second counts in a project, every joint, every cross reference, using the iPad is making his life easier and more accurate. When I asked him how he knew how to use this softeware/app, he said, “ I just kept reading about the things the software could do, then I made it work out for this job.” For most of us the HELP button on each software program, just sits at the top of the screen and when we are stuck, we may check it out. For Dan, the Help button has been a mentor, instructor and guide as he navigates his way through his software to do his job. The Manual for this app is an interactive pdf doc. Dan explained that the PDF manual was a great interactive tool and he used it like an on demand interactive tutorial. When one of his co-workers asked him how he knew how to run this program and how he figured it out, Dan said, “My Mom was all about technology, if you knew her you would know how I followed this problem solving technique.“ So, teachers, be all about technology, encourage all your students, use the HELP button, play and let your students play with the web, play with software, play with the HELP menu, learn it, take charge of it and own it. One set of gas line plans costs about 300.00. When changes are made then the contractor needs to reprint the plans and distribute them to all the clients to ensure accuracy. More printing costs at about 300.00 for each set, again. iPad instant pictures with geotag information. One ipad about 600.00, and the ability to share documents electronically with others, priceless!